Ensuring quality of food and its ingredients is paramount, for which several sterilization processes as used such as heating, moisturizing, and radiation. These processes help in reducing or destroying the micro-organisms in the food ingredients and make them safe for consumption. Rapidly escalating population with which the food demand is increasing, and incremented rate of food product recalls across the world are the primary drivers of the global food ingredients sterilization market. With technological advancements, the risk of foodborne pathogens during the sterilization process has significantly lowered, which is further fueling the adoption of these sterilization equipment and methods. However, lack of awareness among the consumers pertaining to the benefits offered by food sterilization is hindering the market from achieving its true potential. The global food ingredients sterilization market was valued at US$326,069 in 2016, which is estimated to reach a valuation of US$452,046.9 by 2024, rising at a healthy CAGR of 4.2% during the forecast period of 2016 to 2024. 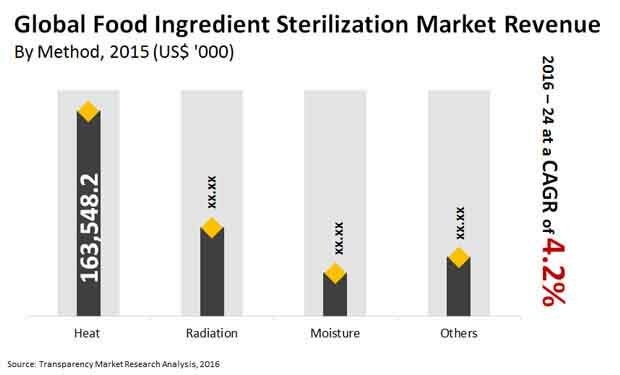 By method, the global market for food ingredients sterilization is segmented into moisture, heat, and radiation, with heat based sterilization posing most of the demand, followed by radiation and moisture. For extended shelf life, food ingredients and products are heat sterilized in order to reduce the possibilities of contamination. To inactivate the production of toxins inside the container during shelf life or transportation, the manufacturers of packaged food often use methods such as microwave-assisted thermal sterilization technology. In addition to that, food ingredient sterilization companies are focused on increasing their production capacity in the lucrative regions of Asia Pacific, North America, and Europe, which will help them serve to rapidly increasing consumer base. Technological advancements in the sterilization technologies is also expected to meet the extended demand coming from the popularity of packaged and ready-to-eat food products. The developed regions of North America and Europe currently serve most of the demand for food sterilization, owing to stringent regulations for food safety and high demand for packaged food, especially in the developed countries such as the U.S. and Canada. However, Asia Pacific has been primed to escalate the demand at most robust rate during the forecast period due to the presence of vast population and rapid urbanization, with which lifestyles are changing and demand for ready-to-eat food is increasing. Lack of awareness among the consumers regarding the benefits of food ingredients sterilization in several countries such as India, China, South Korea, Malaysia, and Singapore is the only challenge faced by the vendors in the Asia Pacific region. Sterigenics International LLC, Balchem, Inc., Safe Spice, Croll Reynolds, and Wenda Ingredients are a few leading companies currently active in the global food ingredient sterilization market. Most of these key players are also indulged in providing sterilization processes for healthcare products and services to maintain their stronghold.